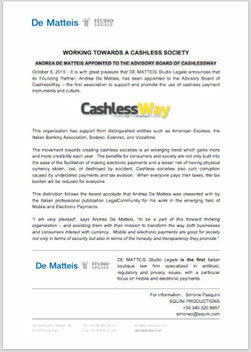 It is with great pleasure that DE MATTEIS Studio Legale announces that its Founding Partner, Andrea De Matteis, has been appointed to the Advisory Board of CashlessWay – the first association to support and promote the use of cashless payment instruments and culture. This organization has support from distinguished entities such as American Express, the Italian Banking Association, Sodexo, Edenred, and Vodafone. The movement towards creating cashless societies is an emerging trend which gains more and more credibility each year. The benefits for consumers and society are not only built into the ease of the facilitation of making electronic payments and a lesser risk of having physical currency stolen, lost, or destroyed by accident. Cashless societies also curb corruption caused by undeclared payments and tax evasion. When everyone pays their taxes, the tax burden will be reduced for everyone. This distinction follows the recent accolade that Andrea De Matteis was presented with by the Italian professional publication LegalCommunity for his work in the emerging field of Mobile and Electronic Payments.